Aye Finance staff at a branch location. In India, micro, small, and medium-sized enterprises (MSMEs) face a $230 billion collective shortfall in accessing the financing they require to grow their businesses. Firms of this size generally lack sufficient documentation and credit history to qualify for traditional bank loans. In 2014, Aye Finance, a small Delhi-based non-banking financial company looking to help close this credit gap, caught Accion’s eye. Aye uses a cluster-based approach to MSME lending, meaning it selects manufacturing and service clusters within a given location, and prioritizes loans to businesses in those segments. For example, depending on what industries in a city or town offer the greatest potential as customers, in one place it might work with woodworkers, shoemakers, textile producers, and carpet weavers, and in another auto parts manufacturers and restaurants. This strategy allows Aye to build a brand identity among the MSMEs it targets. Additionally, since Aye is familiar with the typical financials of a business in that segment and the reputation a prospective borrower has with its peers and partners, it is able to more quickly assess an applicant’s creditworthiness. Lakshiminarayana turned to Aye’s simple, tech-based loan process to help expand his small shop in Bengaluru. Aye rapidly began to distinguish itself from its competitors thanks to its strong understanding of business dynamics and risk, and its ability to disburse loans quickly and customize them to a business’s particular needs. Accion Venture Lab, in its diligence process, was impressed by Aye’s unique cluster-based approach, its willingness to experiment with technology, and the strength of its leadership team. Venture Lab joined with another investor to lead Aye’s seed-stage investment round, took a board seat, and carried out an early-stage portfolio engagement project. As the company began to mature and operate increasingly as an established lender, achieving and surpassing its performance targets, Accion Global Investments participated in subsequent investment rounds, providing Aye with more capital for growth. 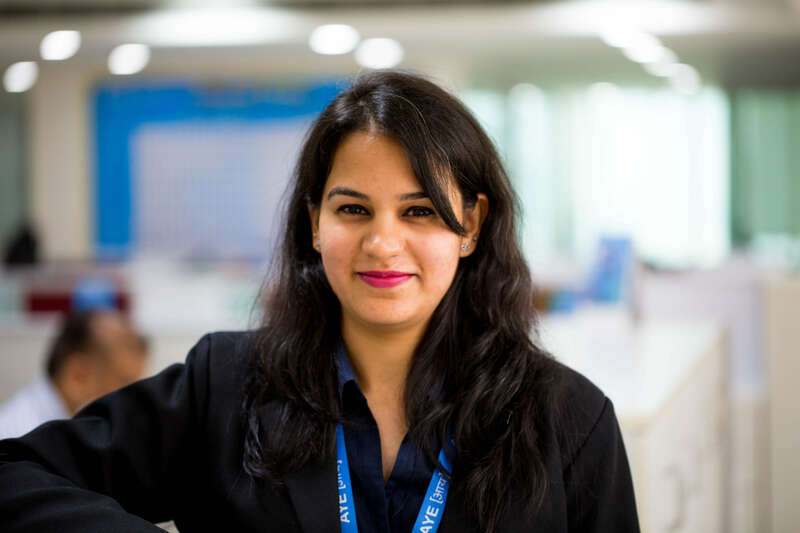 “This business sector plays a vital role in our economy,” says Anvesha, assistant manager of finance at Aye Finance. In addition to its investments, Accion has an ongoing advisory relationship with Aye at the operational level. Accion maintains one of Aye’s board seats, and Accion’s Global Advisory Solutions team has provided technical assistance. building Aye’s internal capacity for scale. Projects include establishing a data warehouse, implementing and monitoring renewal and selection risk scorecards, rolling out tools to provide insights into portfolio performance, selecting and integrating a payment channel, and most recently, piloting and deploying a mobile app for customers. The mobile app helps Aye’s customers monitor transactions and realize better prices, allows Aye to stay in touch with borrowers throughout the loan cycle, and provides Aye with customer insight that informs product design and service delivery. The app was showcased at the 2018 World Economic Forum in Davos and is now available on India’s Google PlayStore. Accion continues to work with Aye on the app’s development and rollout. Today Aye’s network spans 102 branches and 10 states and serves more than 45,000 MSME clients. Its most recent funding round was led by Capital G (formerly Google Capital), the venture capital arm of Alphabet, Inc. Aye’s ability to appeal to these large institutional investors demonstrates that a business model designed to serve low-income customers is capable of staying true to its social mission in a financially sustainable way.